The game started off as a very fun experience. I began playing at the beginning of the game and have seen numerous changes over its run. As time went on, the game got better and better...until the developers began to push the limits. In their attempts to expand the character database and their skills, they started to become very unethical in their money making, bait and switch tactics. Characters were released, thousands of dollars were put in to these characters, and then the developers would say that the characters were more powerful than they intended and ‘nerf’ the characters that you would put time and resources in to. If you complained about it, they would try to hush you with absurdly small amounts of in game resources. Needless to say, it’s on its way to an end more than likely within the next 12 months as more and more players are getting fed up with the constant changes and leaving. The game is becoming too unpredictable, which really takes away all the fun, planning, and strategy to it. TL/DR: EA is using less than ethical tactics to bait and switch people into dumping money and time into a game that used to be a lot of fun. First month player here (4.4m gp roster) This game has been steadily going downhill for quite some time now. The developers decisions seem to be based off one thing and one thing only... how to milk as much money out of their players as possible. It doesn’t matter how much money you have spent they will continue to go after your wallet again and again and again without giving you any real reward for having spent the money you have already spent. I lead a guild (founded first day of the guilds launch) that has 180mil+ power. We haven’t had one join request In over a year. That’s insane b/c we used to get dozens of request every couple of days. Recruiting for your guild in this game has become nonexistent. Players get frustrated at the developer and leave and can never be replaced. The fact of the matter is the developer is doing everything they can to push us old players away and making it next to impossible for new players to catch up. Pay walls that have existed for years are still in place and are never lowered. Now they add new paywalls for low gear levels on new characters?!? For higher gear levels (11&12) I could maybe understand, but for gear level seven and eight? Are you serious? The game has deviated from what made it a great game in the first place. In fact It’s been over two years since the last time they gave us a level Cap Increase. And a year since the last raid. Most of us started playing this game and didn’t give a darn about PVP but that’s all they seem to be adding to the game lately. And speaking of which, they have also set the rules in opposition. 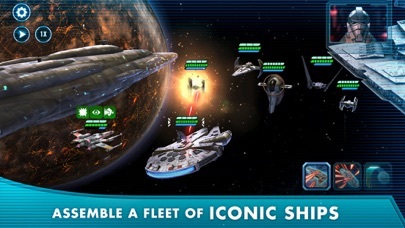 For territory battles you need to maximize your galactic power in order to do better there. 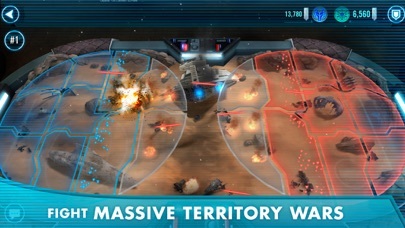 But that’s counterintuitive to territory wars and Grand Arena which Penalize you for maximizing your galactic power. In fact to be more competitive in TW and grand arena you’re better off not leveling any Character that isn’t meta or PVP worthy. That is a total bait and switch move. One of the worst things you can do in the game of this Nature. I refuse to believe that this was an oversight on their part. They cant possibly be that incompetent. That basically means they’re sitting back laughing at us. So it’s just another slap in the face to a players base that they continually mistreat. Why should they care? It’s like being in an abusive relationship with them. They can kick us around all they want because they know we’re not gonna be able to go anywhere else for Star Wars. I spent more on this game that I’m comfortable to admit (enough to buy multiple current gen gaming consuls). I probably would have continued to spend on this game to this day if the developer hadn’t become so greedy. I’m proud to say that I closed my wallet off to them well over a year ago and as it stands they will never get back into it unless they make major changes to their modus operandi. Great Game! Just poor decisions! This game is amazing! 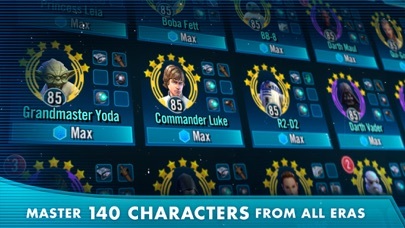 Has a ton of characters and you can get all of them free to play just with a toooon of patience. But it’s a resource management game and it’s strategic. Love the game play! Now for why I gave it 3 stars. The developers just aren’t making the best decisions at the moment. For example. They started at 3 attempts at hard nodes, then when to 5, then went to 8 which was great. Well they lowered it back to 5 after the player base was used to 8 attempts for 8 months. When you give something out for that long it’s a jerk move to take it back down. So characters take even longer to get now. Another complaint is the reworks. 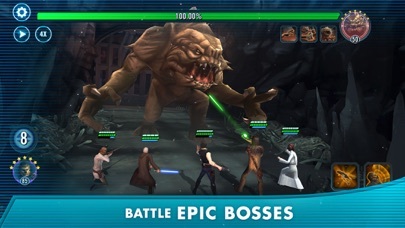 They recently reworked grevious, anakin, ahsoka, and obiwon. Grevious sucked, anakin is getting nerfed. It’s like they don’t play test their characters. Then if players work hard to find good counters to the current meta, they nerf it so those who spent money feel invincible. I can go on with some other poor decisions but you get the point. So great game just needs some work with having a good direction from the developers. Get into a good guild and you will greatly enjoy it! This game will just make you angry. Even when you win you lose. Hardly any payouts. The free stuff is just to make you think you’re getting free stuff, but it just hands out junk you don’t need. I’ve got over 5000 of 1 item that I rarely use. Takes months to get what you actually need. They limit how much of an item you can share with your guild, especially if it’s a rare item. You can give up to 10 non rare items or 1 rare item that you probably need for yourself cause they make it to hard to get random items. I don’t know how they managed a 4.7 star rating. Massive rip off. And yes I have spent money on this game but never again. You guys should put more General Grievous shards in the store. This game is fun early on, but once you reach higher levels, the mods component totally ruins it. If it were free to remove mods once you assign them, it wouldn’t be terrible, but having to stomach the cost of removing them really ruins the game. The shift by the developer to make this clearly a pay to win title has alienated a lot of players who have been supporting this game since launch. 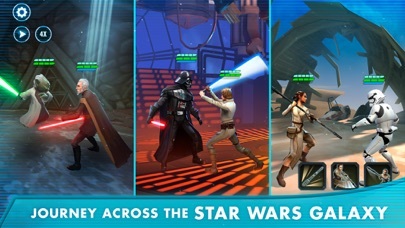 This game is great for Star Wars fans, competitive players, or just people looking to collect the characters. Great graphics and always adding new content.